After a sound and solid night’s sleep, and the memory of the previous days’ warm sunshine, I awoke to rain. I felt so excited to be starting at last, the damp skies seemed a tiny matter. Today my Camino journey would begin. The theme for the day was discovery. I discovered two things in particular this day — what it was like to walk as a real pilgrim and what amazing people my fellow pilgrims were. At breakfast in the albergue, our hosts informed us that the traditional route was closed due to snow. Pilgrims were being strongly encouraged to go the “lower” route through Valcarlos because the elevation was slightly lower and thus less snowbound. I felt immediate disappointment because I wouldn’t be able to keep my reservation at the darling albergue in Orisson. But this change turned out to be quite a blessing for my body. I would have struggled to make that long 23km leg over the mountain. Before starting out, Marisela, Katrin, and I stopped at the post office to mail home packages of non-essentials. We stood in the middle of the small but gleaming space like three massive Quasimodos in our rain gear, in the way of customers, dripping wet puddles on to the floor. Our shoes squeaked across the spotless linoleum floors as the helpful staff directed us around and showed us what to do. I admired their patience. No doubt, they’d seen it all before. And then, several pounds lighter, we were on our way, the three of us together. Down to the church to fill our water bottles at the public fountain, we crossed the familiar bridge and then proceeded up the cobblestone street that led to the Camino. I’m walking! I’m on my way! Despite the intermittent rain, I felt excited and a little shell-shocked. So… Huh! You just walk? 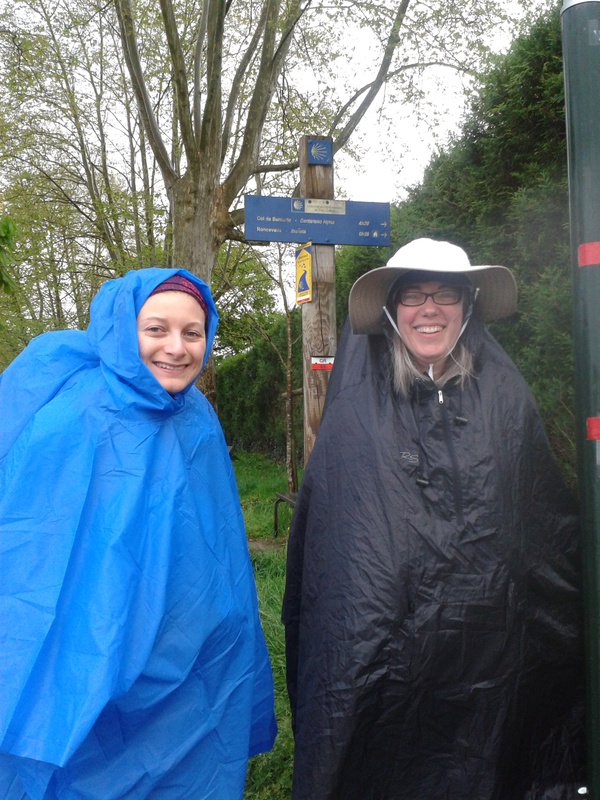 Marisela stopped to take our photo at the first official Camino sign we saw. We stood at the intersection where the normal Camino and the alternate Valcarlos route split, trying to determine which way to go. 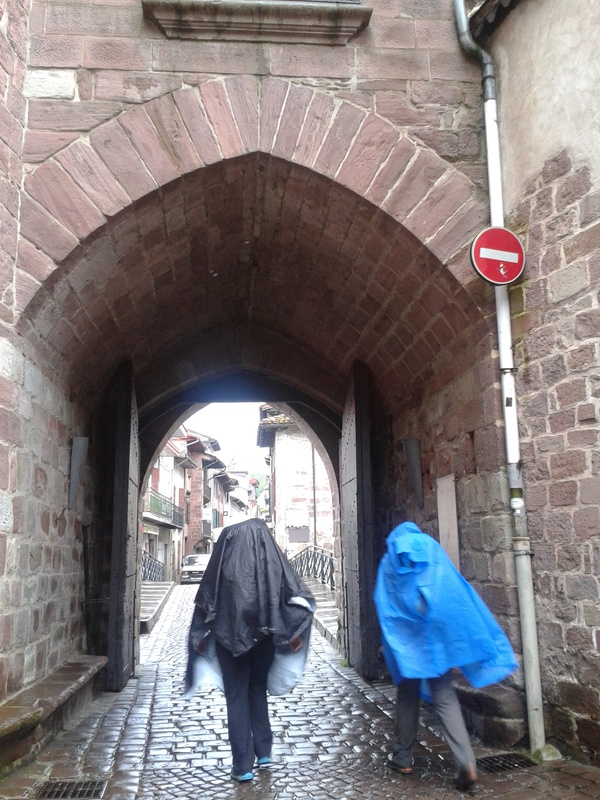 We must have been a madcap sight pointing this way and that, consulting our multilingual guidebooks for insight. Eventually, we found ourselves tromping in the right direction, single-file through the long wet grass on a path running adjacent to the highway. Pilgrims were ahead of us and behind. On our way. The highway path eventually veered away from the road and turned to woods, which were much quieter than the traffic and spray. It felt like we were alone, the three of us, despite having seen many people walking earlier. I marveled at the many plants I noticed along the way, some of which I recognized including wild orchids, yellow poppies, hellebore, violets, purslane, and primroses. I relished getting to know my new friends, Katrin and Marisela. Both of them spoke excellent English. We laughed a lot – giddy from the excitement and enjoying one another’s company. Katrin and I compared notes about the names of the flowers in German and English. We discovered the city girl in Marisela. She looked at us quizzically when we asked the names of flowers in Spanish. In hindsight, I know that my excitement was more fun to share and I spent much of my energy getting to know these two lovely new friends, drawing them out, forgetting myself. It’s my way. Later I would struggle with wanting independence and not knowing how to ask for it, but their companionship was a delightful, unexpected blessing for my journey’s beginning. To my delight, I discovered that walking wasn’t so bad. Coming from a happy homebody, that’s saying a lot. The forests were enchanting with budding green trees and lovely streams. There was a lot of pasture and road. The few villages we passed through provided shops for provisions and rest rooms. The terrain was up and down with and a few steep spots, but I kept thinking all day, I’m walking! On the Camino! Unreal! That is, until we approached Valcarlos. I started feeling twinges of fatigue and are-we-there-yet-itis. Although the distance was moderate, I wasn’t used to the elevation or the hours of endurance required. We went down into a valley with a beautiful stream at the bottom. I hadn’t yet learned to dread stream beds or associate them with an impending hill. For after the stream, we hit what was nothing short of a vertical wall of concrete. The concrete path had textured, horizontal lines – for traction purposes, I suppose – and went straight uphill. I tried to power though. I got winded. My chest burned. I had to stop every few minutes to catch my breath. The concrete path made an abrupt right turn and I assumed I’d reached the top. No luck. It continued upward to a point I could not see ahead. Feeling less certain of myself, by some miracle I reached the top, gasping heavily. Not for the last time on my journey, I seriously questioned whether this had been such a great idea. I wasn’t sure about Marisela or Katrin’s plans, but I could feel in my bones that I was done for the day. I was spent, physically, mentally. I just wanted to lay down. It was siesta time when we arrived in Valcarlos. Nothing moved. Not a single car passed through the little town with steep hills as its backdrop. With Marisela’s help in Spanish, we untangled the complicated machinations of getting a key from the local bar and sought out the town’s single albergue in a concealed location. With relief, we arrived, moved our stuff in, and turned our focus to showers and recovery. Together, they whipped up a gorgeous dinner of pasta with garlic tomato sauce, fresh bread, and salad. After a long, damp day, you can’t imagine how gorgeous a gift this was. I felt grateful beyond words. We bought dessert and a bottle of red wine from Rioja to contribute to the feast. Dinner conversation was mostly in English and French, there was lots of laughter as the topics bounced from noun/gender agreement (and the lack of this in English) to the nature of words to spirituality. Gathered around the table, it felt like family in the best possible way. How could I fit this much living, so much richness, into a single day? Heart-warmed and surrounded by strangers-turned-friends, we toasted our Camino and, later, I slept soundly and peacefully. Exertion and exhaustion make fabulous sleep aids.